Once Moegyo members have seen the photo of Mg Win Htun, they wanted to help with the boy’s bump on his nose. But they were quite scared that something might go wrong with the operation if not done properly. Anyhow they were still eager to help the boy. Last month I got an email from one of Moegyo members that Oliver’s MCA group has been helping that kind of patients. Once I got his email and his phone number, I tried to contact him and try to get appointment with the surgeon who could operate on the boy. 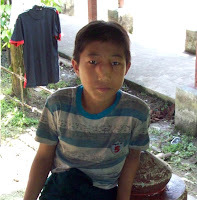 Then, I informed the Pay-Chaung Parahita school that the boy was going to get his operation. They were very happy and awaiting my reply of the operation date. The boy was also very happy that he will have his bump on his nose removed. The boy must have all the luck since I always got direct contact with Oliver and he helped the boy get the operation date so quickly. As soon as the date was confirmed, I informed the school to bring the boy to Yangon for his operation. The boy along with the school chair person arrived Yangon on 8th November. Due to some transportation problem, the time they got to Oliver’s office was quite late and the boy could not get admitted to the hospital on that day and they had to stay at the hotel and dinner was arranged for them on that day. Next morning (9th November), he and his school chairperson, U San Maung, (who accompanied the boy during his hospitalization) went to the hospital to register the boy. He got admitted at the Yangon Neurological Hospital and then was sent to Pin-Lon Special Clinic to get CT scan and blood test. Not to get fright with the environmental change for the boy, I went there with them. Surprisingly, the boy seemed calm all the time. He was just smiling and pleased with the new environment. After the check-ups, we all got back to the Yangon Neurological Hospital at 1:30pm. U San Maung and MCA’s staff went to make registration and the staff showed U San Maung the shop that he had to buy medicine for the boy. Everything was new and so strange for the boy that he looked at everything around him in awe. Even the trains that going passed at the back of the hospital was quite amusing for him to see. On that day, I also met with the Professor Dr. Myat Thu (the head of Neurological Department). He also encouraged the boy that everything is going to be fine that his bump is not so big and not so serious. Doctor also was very glad that we brought this boy to hospital that he has got some experience that some of the patients could not get the operation done since they can’t even afford transportation to get to Yangon. Since the doctor found out that the boy is an orphan, he tried to squeeze in his busy operation schedule and gave us an operation date as soon as possible. We got the operation date on Friday (12th November) even though he wasn’t on duty that date. He also showed the photos of the operation and the stitches he made for the boy. He also told me that whenever I find someone with condition of the boy, please take him/her to this hospital as soon as possible. Since he has been getting the medical and accessories help from Oliver’s group, he is always ready to help them get operation. During the stay in the hospital, MCA provided all the medical charges and meal for the boy. The things that are needed at the hospital and trip expenses are provided by MHF. Everyone in the hospital said that the boy was very lucky that everything was ready for him. After 5 days of his operation, I have got a phone call from the hospital that the boy is going to be discharged since his wound is so dry and in good condition. They went back to kyite-latt on 19th November (Friday). At first we tried to arrange to send them to visit some places in Yangon, but we could not make it happen unfortunately. During the time in the hospital, Maung Win Htun took his bath 4 times a day as he was so happy to take a bath in the bathroom. He eats 3 plates of rice for every meal and 2 bowls of Mote-hin-gar every morning. He was also going around the hospital talking with the patients around him. He was also very happy for by other Moegyo volunteers, Ma Thi Thi and Ma Thuzar’s visit. 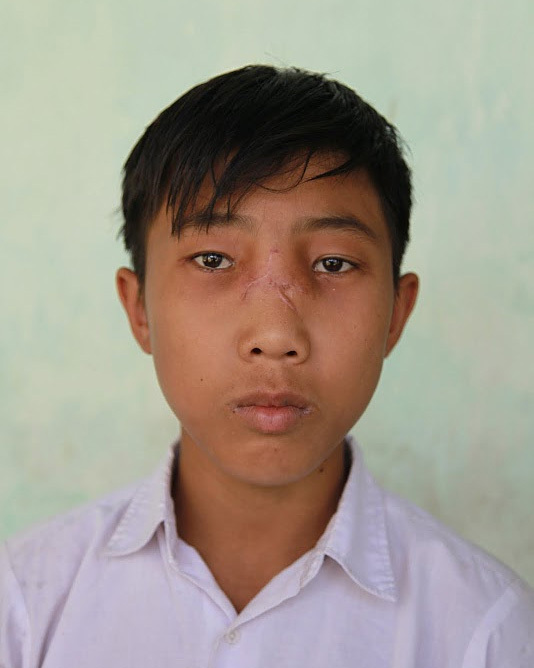 Last time we visited Pay-Chaung Youth Development Center, we met Maung Win Htun being happy that the bump on his nose was gone and all surgical wounds healed. I’d like to thank Oliver Soe Thet of Myanmar Chefs Association and Prof. Dr. Myat Thu of Yangon General Hospital Neurological Department for helping with Maung Win Htun operation.